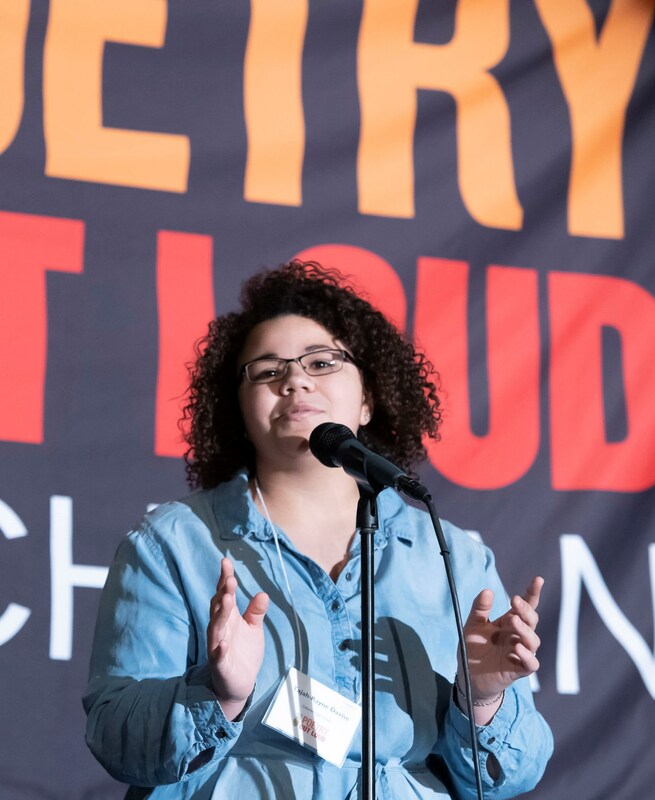 Tajah-Rayne Davise from Calumet High School was named the 2019 Poetry Out Loud State Champion for Michigan after completing three rounds of the annual recitation competition at the Lansing Crowne Plaza on Friday, March 1, and Saturday, March 2. The 2019 first runner-up is David DeBacker of Detroit Catholic Central High School, second runner-up is Grace Garver of Petoskey High School, and third runner-up is Soja Kureekkattil, of Rochester High School. On April 30 and May 1, 2019, Davise will represent Michigan at the National Finals for Poetry Out Loud in Washington, D.C.
Read the full press release from the 2019 Poetry Out Loud State Finals here.